I'm all for a straight-ahead, no-fuss, guacamole. Nine times out of ten, that's how I approach it. Let the avocado shine. Don't distract with tomatoes, or pomegranate seeds, or too much lemon, or too much lime. I wrote some thoughts about guacamole basics here. That tenth occasion? I'll work in a wildcard, or take a surprise approach. Something along the lines of what you see pictured here, a recurring favorite. It's a recipe I shared years ago in Super Natural Every Day, loosely inspired by a preparation I came across in Julie Sahni's Classic Indian Vegetarian and Grain Cooking. 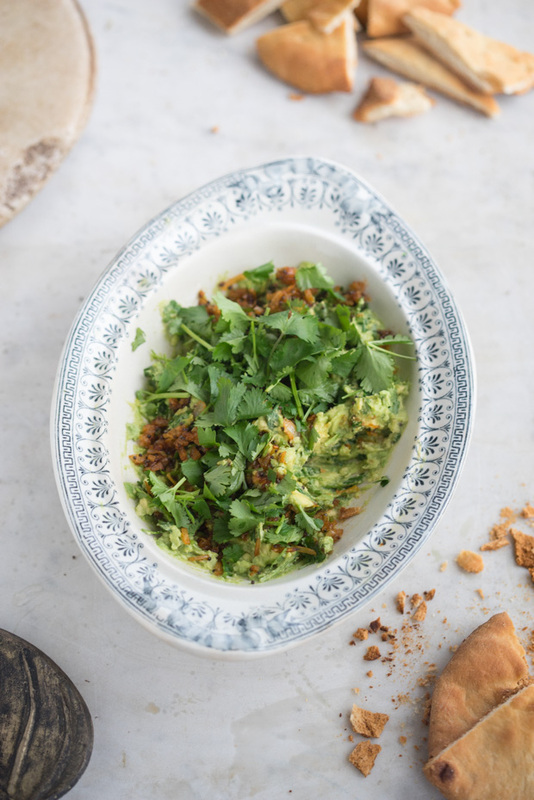 Imagine guacamole topped with fragrant, Indian-spiced onions and garlic, green chiles, and mustard seeds. The creamy, ripe avocado melds beautifully the savory bits, and the vibrant cooking oil works its way into all the little valleys. People love this with chips, toasted pita, or naan bread. 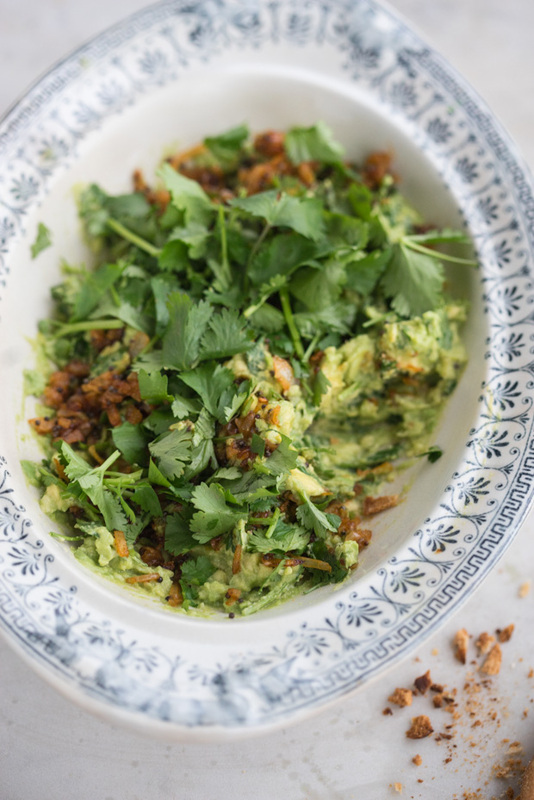 If you're in any sort of a guacamole rut, give this a try. A quick side note - I can also imagine a Thai-spiced version being wonderful (with green curry in place of the Indian curry paste. Heat the clarified butter or oil in a skillet over medium-high heat. When it is hot, add the mustard seeds. Keep a lid on hand because the seeds will scatter as they pop. When the spattering stops, after about a minute, stir in the onion and sauté for 2 to 3 minutes, until the onion is translucent. Stir in the garlic, curry powder, and chile. Count to ten, and then remove from heat. Stir in the avocado mixture, but just barely, and transfer to a serving bowl. Serve warm or at room temperature. Garnish with remaining cilantro. A California-inspired Miso, Avocado, & Lima Bean Salad from A Modern Way to Eat, by Anna Jones. Seasonal greens and beans are tossed with an assertive, creamy miso dressing. There are crunchy seeds, and broccoli, and avocado - it all comes together into a brilliant, beautiful, feel-good salad.